Boulder County Legal Services (BCLS) celebrated the outstanding tradition of pro bono service in Boulder County at the Annual Pro Bono Luncheon, held April 21st, 2014, at the Boulder Marriott. BCLS honored local attorneys, mediators, law students, and paralegals who volunteered 6,784 hours in 2013 to provide legal services to low-income residents of Boulder County. An annual highlight of the event is the presentation of the John Marshall Award, which is awarded annually by the Boulder County Bar Association in honor of John Robert Marshall, a local attorney who tirelessly advocated for the poor. 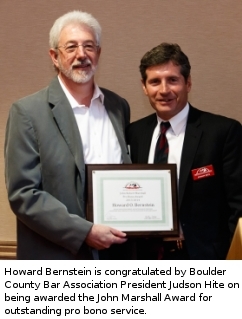 This year’s recipient, Howard Bernstein, was recognized for his quiet dedication and his generosity in accepting pro bono clients referred by BCLS over the past two decades. Colleagues remarked on his humility, his inspiration to those he mentors, and his strong belief in giving back to the community. Howard has volunteered on the BCLS pro bono panel since 1998, helping clients with IRS matters and mentoring young attorneys. With a strong belief in giving back to the community, Howard serves on the Board of Directors for Open Arts. He raises money for the Children’s Hospital by riding in the Courage Classic cycling tour, and assists non-profit organizations at reduced fees. He lectures on legal ethics, taxation, employment and international law topics for lawyers, and is a regular moderator at the Conference on World Affairs at the University of Colorado. Thank you to CLS Volunteers!